Are you looking for a storage structure that provides plenty of space for a variety of items while adding to the appearance and value of your property? 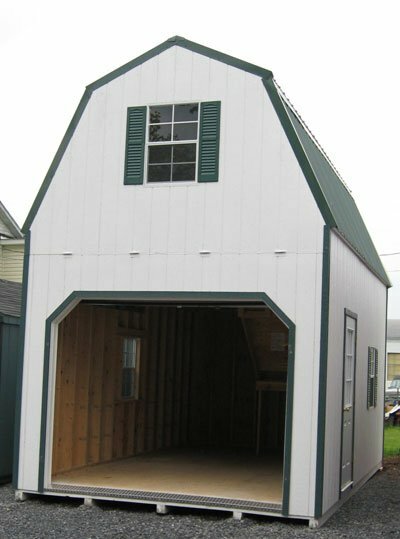 If so, checkout our online inventory of affordably-priced two-story sheds for sale at great low prices. Our large selection of models, colors, and floor plans offers you the opportunity to find exactly what you want at a price that fits your budget. At Alan's Factory Outlet, you can choose a 2-story metal building in a size that fulfills your storage needs and fits in with the dimensions and limitations of your property. 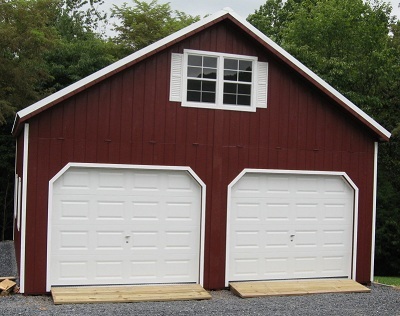 We have single and double-wide two-story storage sheds available for sale now. One popular use is to purchase a double-wide 2-story metal building and use one side to house your car. The remaining space can then be used to store tools, sports equipment, a riding lawnmower, a push mower and more! When you buy one of our 2-story sheds for sale you have the opportunity to choose the color of its walls, as well as its metal roof. Our metal roofs come with a 40-year warranty. Or, if you prefer, you can order a roof made of architectural shingles that comes with a 30-year warranty. In addition, you can select either a barn roof or an A-frame roof design for your new shed. Our wood 2 story sheds come with Duratemp wooden siding with an all plywood interior. This siding has with a 25-year warranty. 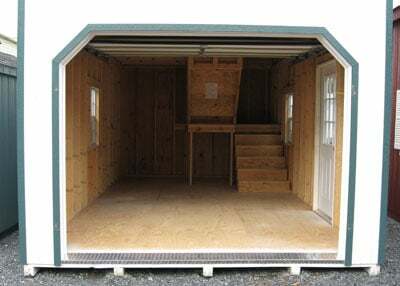 Our two-story storage sheds are designed to endure harsh weather conditions, while keeping your possessions secure. Order and receive a quality storage structure that is made to last and protect for years. See the specifications below for more information on the warranties available on our two-story storage buildings. If you have any questions feel free to contact us. A staircase leading to the 2nd level or a pull-down ladder. A 9x7 insulated garage door to keep your two-story storage shed secure. Five 40-year pressure-treated foundation skids to keep your shed off the ground and protected from pests and the environment. 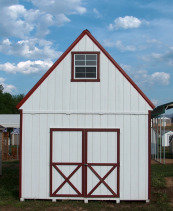 Single-wide 2 story sheds are 17' tall at the peak with 10' sidewalls. The headroom on the first and second floor is 8'. The A-frame pitch is 14/12 and the barn roof gives you even more headroom on the 2nd level. 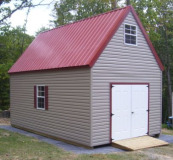 *Floorless two story sheds are also available to go on a concrete pad. A staircase going up to a 2nd level. 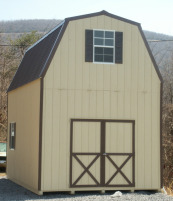 Our double-wide 2-story sheds for sale are 18' tall at the peak with 10' tall sidewalls. The A-frame pitch on our double wide 2-story structures is 8/12 pitch. 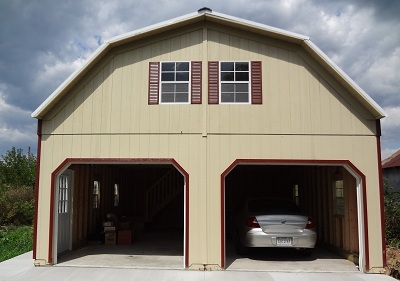 The barn-style 2-story structures give you even more headroom on the 2nd level. The headroom on the first level is 8' and 8' at its peak on the 2nd level. 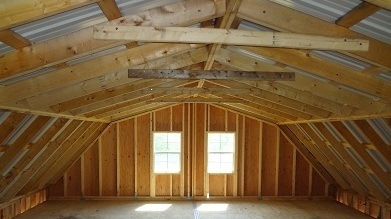 This means that all of our two-story sheds for sale allow for lots of room to move as well as plenty of storage space. Our 2-story buildings are available in wood or vinyl. The vinyl siding comes with a lifetime warranty. 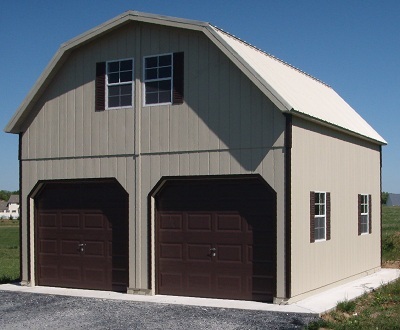 Board & batten siding is another popular option for our 2-story storage sheds. Take the video tour below of our two most popular 2-story sheds. The first is a 12x20 2-story barn shed with a floor. The 2nd is a 24x24 double-wide barn 2 story shed without a floor.